As we completed our book on the US research university amidst the political tumult of the last several months, we resisted the urge to add laments, policy recommendations, or vision statements to the growing pile. Instead, we sought to reframe familiar arguments about the university by calling attention to its media, which are so often looked past (or through) by critics of higher education. To ask, that is, not only what kinds of knowledge universities provide and how that knowledge is or should be valued, but also whom they address, by what means, and with what consequences It turns out that manifold media engagements called our universities into being and guided their development. Accordingly, a university capable of thriving in the present requires attention to how it informs--conveys knowledge and gives shape to--its various audiences. Football provides one case in point. First Football Game Played at the University of Oregon, 1894. Although central to the college experience for many, football is typically presented as antithetical to the university’s educational mission. In truth, this familiar opposition belies a complementary relationship. Unlike the German and English institutions that provided their prototypes, the burgeoning US research universities of the late nineteenth century had no ready market for their credentials: neither government service nor the traditional professions required then. To promote their efforts and build their student bodies, American universities relied on mass media. Illustrated weekly magazines such as The Saturday Evening Post, Munsey’s, and Cosmopolitan spread the message that college offered upward mobility. It also promised a good time. “The single most important change in American higher education at the end of the nineteenth century,” explains educational historian John Thelin “was that college-going became fashionable and prestigious.” Turn-of-the-century media depicted a fascinating student lifestyle that had football at its core. It is a simplification, but not an unwarranted one, to observe that football built the modern American system of higher education. Football not only attracted students but also structured arguments about the university’s mission and who should determine it. The game and all its trappings made sense of “college” at a moment when the curriculum was unlikely to do so. By the end of the nineteenth century, many universities had adopted an elective system. Any two undergraduates might take two almost completely different sets of classes, and those classes competed with each other for enrollments. Harvard, the standard-bearer for this approach, reduced subject requirements in stages through the 1870s and 80s. By 1897, it required only a year of rhetoric. As Harvard’s new president in 1909, Abbott Lawrence Lowell spoke for many on the faculty who hoped to reverse this trend. They began by adopting a system of majors. Nationally, schemes for accommodating student choice within majors and general education requirements soon prevailed. Students needed such rules, University of Wisconsin President Glenn Frank explained in a 1926 interview, to avoid narrowness that “destroys perspective” and to cultivate “an ability to correlate the knowledge gained in the specialist’s field with the other facts and phases of life.” To illustrate, Frank seized the obvious example: “One reason why football attracts so much more of the undergraduate’s attention is that a football game is a vital, dramatic whole.” As consensus emerged that undergraduates needed administrators and faculty to structure their educational programs, the rival and paradoxical model for such a unifying program was clear. At the University of Chicago, which had built itself on its football reputation as much as its academic one, 1920s general education advocates pitched their “New Plan” as a football alternative. University president Robert Maynard Hutchins argued that abolishing the sport would “confirm the pioneering reputation of the university and in one stroke do more to make clear what a university should be than we could do in any other way.” From this point onward, academic and athletic branding could appear as mirror images, as if attention to the former could set right the distortions of the latter and, conversely, as if the audience-organizing power of the sport modeled the ambition of general education. Although football roughly paralleled the trajectory of the elective system in increasing attention to professional management of student choice, the sport clearly compelled larger audiences. In the 1890s, students themselves largely organized the Saturday afternoon game, which also connected them with returning alumni. By the 1920s, universities had transformed student-generated symbols and rituals into official campus culture, thereby making them available for wider usage in recruiting and marketing. School colors and mascots became official colors and mascots. Officially sanctioned college songs and societies, yearbooks and festivals supplemented and sometimes replaced outright their student-made precursors. Where “student managers” and alumni donors once ruled college sport, professional coaching staffs and powerful Athletic Directors held sway. Universities constructed giant stadia. 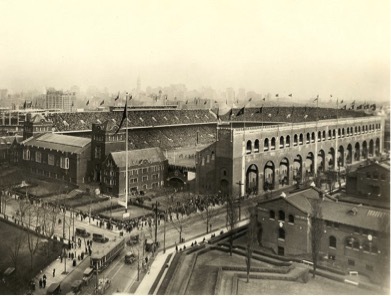 Penn and Harvard launched a decades-long construction boom at around the turn of the century with structures capable of holding 40,000 fans. Yale upped the ante in 1914 with the 70,000-seat Yale Bowl. Yale’s enrollment, including professional schools, then totaled around 3300 students. A wave of big stadium construction followed nationwide. Meanwhile, various media extended the game’s audience-organizing power beyond the stadium’s stands. Historian Michael Oriard credits the daily press with transforming football into a national sport, which also sold papers. Radio quickly joined print. Advertisements for radio sets featuring listeners tuned to football appeared as early as 1923, and NBC radio covered the Rose Bowl in 1927 when it emerged as the pioneering national commercial broadcast network. Meanwhile, at the movies college football provided a newsreel staple, and scores of feature-length musicals, dramas, and comedies centered on the sport. Time put “Football’s Public” on its cover not once but twice. As a cross-platform mass media phenomenon, college football lent its patterns to--that is, informed--national culture. University of Pennsylvania’s Franklin Field upon Completion in 1922. Football crowds were not only larger than classroom audiences, they were also better organized. General education planners proclaimed similarly broad, and much loftier, aims, but they struggled to deliver on anything like football’s scale. Columbia College Dean Herbert Hawkes, for instance, felt requiring a course in Contemporary Civilization would make each student a “citizen who shall be safe for democracy.” Yet no two schools’ students performed general education in precisely the same way. There has never been a common curriculum uniting the nation’s universities. Instead, our postsecondary education system is knit together by an abstract measure of time spent—the Carnegie unit. The peculiar mirroring of football and curricula despite their differences, as if the audiences each addressed were not simply overlapping but should be in some sense the same, bespeaks a persistent rejection of the university’s reality as a media maker. American universities have always relied on football crowds as well as course enrollments; one is not more essential to the enterprise than the other. Nor have syllabi and football games ever been aspects of a singular address to the same audience: universities have always worked across media, the better to empower and connect myriad demographics. Remarkably, football’s early twentieth-century cooptation by professional staff did not alienate students. They continued to see themselves as key participants in the audiences orchestrated by media professionals. That remains the case almost a century later, even after network television contracts have sorted universities into greater and lesser football schools and Title IX has recast college athletics as a space of political contestation. Witness a November 2015 tweet featuring a photo of some thirty black University of Missouri football players, a quote from Dr. Martin Luther King, and the declaration: “We will no longer participate in any football related activities until President Tim Wolfe resigns or is removed due to his negligence towards marginalized students’ experiences.” University President Wolfe resigned two days later, leading The Chicago Tribune to marvel at “The Power of a Football Strike,” Time to proclaim “Missouri President Toppled by the Power of the Student Athlete,” and ESPN to make the team a 2016 winner of the Stuart Scott ENSPIRE Award. The headlines overlooked the newer medium of Twitter for the message of football’s commanding presence as an established media power. Nonetheless, the Mizzou incident demonstrated conclusively that the right students with the right cause at the right time could use media channels open to them to reappropriate football and precipitate dramatic change. The academy's century-long media history offers many such lessons.